The Syrian Civil War started in 2011, and fighting has practically not stopped since. Damascus is an area where tank combat is most famous, due to the famous Mahmia (AKA Adra) and Shafrah T-72 armor upgrades. An estimated 700 T-72s are believed to have been delivered to Syria in four batches. The first two batches came from the USSR. The first, in the late 1970s, consisted of 150 T-72s (the initial production type, the Object 172M, AKA T-72 “Urals”) and the second batch, consisting of 300 T-72As, came in 1982. The T-72As were a very rare export, as these were not even sold to Warsaw Pact countries under the USSR. The 300 T-72As were divided between the Republican Guard and the 4th Armored Division and were all eventually upgraded into T-72AVs, featuring Kontakt-1 ERA (Explosive Reactive Armor). The third batch of T-72s consisted of 252 T-72M1s, which were ordered from Czechoslovakia, of which only 194 were delivered in 1992 due to the dissolution of Czechoslovakia. Slovakia eventually delivered the remaining T-72M1s in 1993, in what can be considered a fourth batch. Between 2003 and 2006, 122 T-72s, of all types, were upgraded with Italian TURMS-T FCS (Tank Universal Reconfiguration Modular System T-Series Fire Control System) and tanks upgraded to this standard had the letter ‘S’ added onto their designations. ‘S’ stands for “Saroukh“, meaning “Missile“, which refers to these tanks being able to fire the 9M119(M) guided AT missiles from their guns. An estimated 100 of these upgraded vehicles are in service as of 2014, mostly in service with the Republican Guard. Some were lost in Damascus in 2013 during the early stages of the Civil War, but the remainder is believed to be held in reserve thus far because T-55s and T-62s are in such large supply. An estimated 300 T-72s, of all types, remain in service as of 2014. 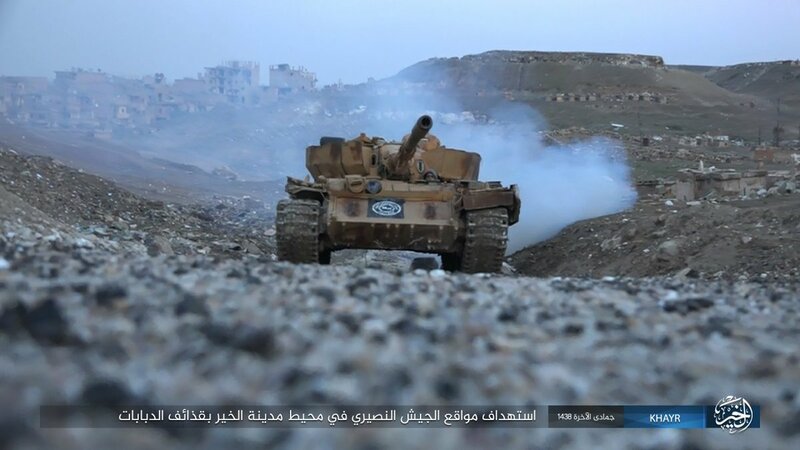 19 T-72s (13 T-72 Object 172Ms, and 6 T-72AVs) are operated by ISIL, and 8 (2 purchased from a corrupt officer, and 6 captured, of which 1 is a T-72M1S) are in use by Jaish-Al Islam. The rest are still operated by government forces. All too common are photos of battle-worn T-72AVs fitted with exceptionally crude armor upgrades. These come in two distinct types. The first is mesh baskets on the turret (presumably made from thin metal pipes or similar commercial materials such as wall insulation mesh) which are filled with building bricks and rubble in order to replace Kontakt-1 ERA which has been lost. This was a modification usually done to the turret, but some examples show mesh sideskirts made from a similar material. For the sake of clarity, the unofficial name of “T-72AV Labna” (meaning “brick”) will be used to designate these. Tanks upgraded in this fashion still appear today, with new innovations such as sandbags being used instead of rubble. It is reported that this was a design first introduced by the 4th Armored Division. 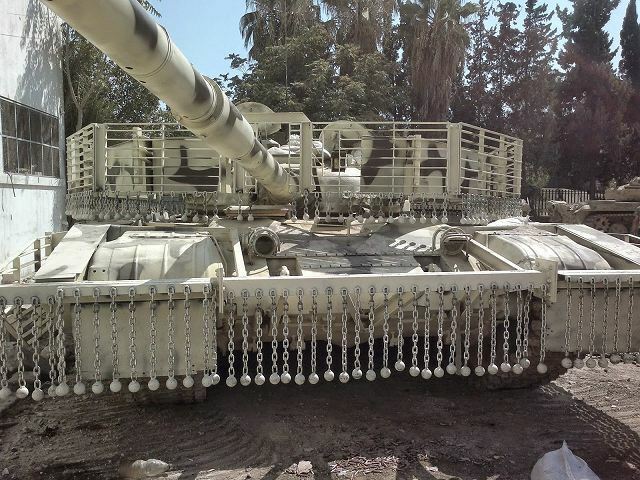 The second type of improvised uparmoring is spent shell cases being strapped to the vehicle’s hull and turret, often with a similar mesh basket / cradle as seen on T-72AV Labna tanks. Various types of vehicles use this type of uparmoring, including T-72s and T-55s. It seems likely that these upgrades were an attempt to stop missiles and RPGs from penetrating armor, but without a doubt, the real combat effectiveness of these improvised and crude up-armoring ideas is negligible. Whilst they might cause an RPG to explode a short distance away from the armor, it is probable that the rubble or thin shell cases would not absorb the impact, and the projectile may still damage the vehicle in some manner. In short, these crude upgrades were simply not up to the task, but the idea of up-armoring was sound enough to receive further attention. From August, 2014, the 4th Armored Divison began to upgrade T-72M1s, as well as military bulldozers, and at least one ZSU-23-4 “Shilka” from their workshop in Adra (north of Damascus). 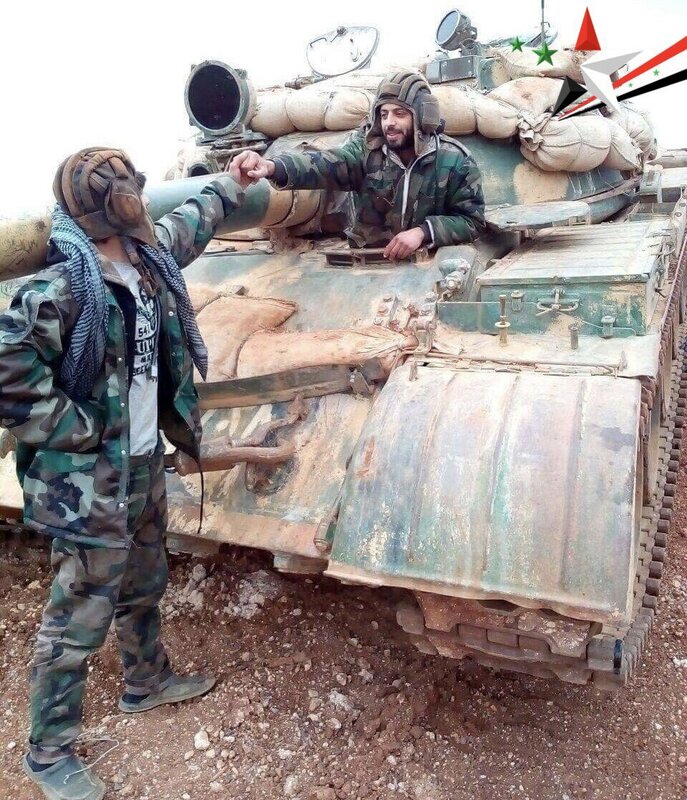 This has earned them their unofficial name of “T-72 Adra“, but primary sources (such as tweets and Youtube videos from Syrians) refer to them as “Shielded T-72s” or “Shielded Tanks“, hence the name “T-72 Mahmia“, meaning “shielded“. It is highly likely that the 4th Armored Division may have a specific, but unofficial, name for these T-72s. Whilst the T-72 Mahmia (also known as the T-72 Adra) upgrade of the SAA 4th Armored Division was successful at defeating RPG-29 hits, it was not consistent with defeating ATGMs. 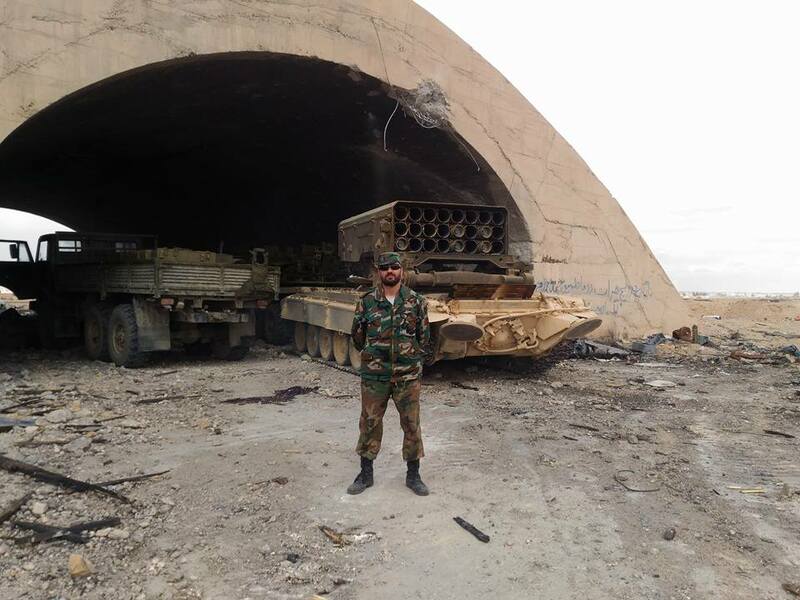 In recent months, it seems as though tank upgrades have been centralized by the Syrian Arab Army, with the intention of making a new type of upgraded T-72 that is invulnerable to all missile types. This mysterious upgraded T-72 project has been dubbed “T-72 Grendizer”, which refers to a popular Japanese cartoon show that was popular in the Middle East in the 1980s – children of that era now being the tank crews of today. Unlike the T-72 Mahmia, the T-72 Grendizer appears to be a centralized project headed by the Syrian Arab Army Republican Guard, as opposed to its 4th Armored Division. However, the T-72 Grendizer is not yet a finalized design – it is merely a concept. There are only a few things that are known. Firstly, it will be a T-72, and secondly, it will have armor intended to resist all enemy missile types. The T-72AV Shafrah was a testbed for armor that could have, if it were deemed successful, been used on the T-72 Grendizer. The official testing phase for the T-72AV Shafrah began on 27th February 2017, and appears to have ended on 22nd March. However, other vehicles (including at least one bulldozer and ZSU-23-4 Shilka) have had Shafrah armor upgrades, which have only been seen from late March onward. Other Soviet supplied vehicles are believed to be scrapped, or in museums only. Pair of SAA (Syrian Arab Army) T-62s, in the aftermath of the Battle of Azaz, August, 2012. An up-armored T-55 operated by ISIS, Deir ez-Zor, Syria, 13th March 2017. SAA T-55, unknown location, 6th March, 2017. SAA TOS-1, believed to be at Palmyra Airport, 13th March, 2017.